On Microsoft Windows computers, the Desktop Searchbar is the most easily accessible Coveo access point. Windows logo key+C in previous Windows versions. By bringing your mouse pointer over the thin horizontal line floating at the top-center of your screen. You can modify Desktop Searchbar default shortcut key combination (see Modifying the Desktop Searchbar Shortcut). Coveo .NET Front-End 12.0.960– (September 2014) When the Desktop Searchbar is installed on a Windows 7 computer and you update the computer to Windows 8.x, for Coveo .NET Front-End versions prior to 12.0.992 (October 2014 monthly release), the default Windows logo key+C Searchbar shortcut key will no longer works. You must change the key combination to Windows logo key+Shift+C or another valid combination of your choice. Coveo .NET Front-End 12.0.992+ (October 2014) The shortcut key change is done automatically. Desktop Integration Package 12.0.316+ (October 2013) You can modify the color scheme of the Desktop Searchbar (see Creating a Custom Color Scheme for the Desktop Searchbar in the Windows Registry). 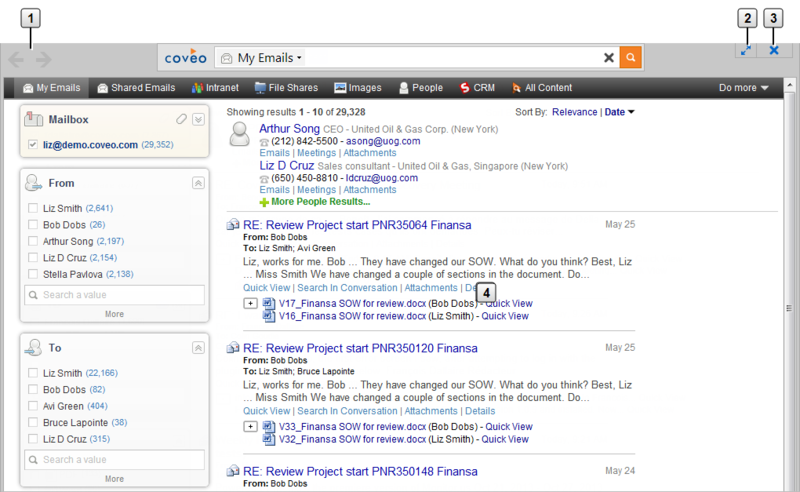 Once a search is launched, the floating search results window appears as shown in the following example. The window disappears when you click a result link but when you reopen the Desktop Searchbar, the last query and results are still available, allowing you to easily come back to review other results. Query Navigation buttons – Click to go to the previous or next query. Separate Window button – Click to detach the current search results in a separate window allowing you to see results for more than one search result window at a time. Close button – Click to close the floating search results window.